Red-spotted newt is often called eastern newt because of it’s distribution and can be found in southern Quebec, southern Ontario and the maritime provinces excluding Newfoundland. Red-spotted newt reach 5 to 10cm in lenght and are red-spotted with a yellow belly. Adult loose their bright colouration over the years. 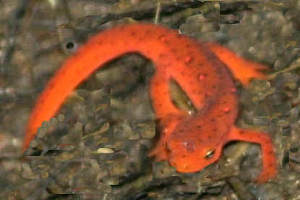 The terrestrial form of juveniles which are called efts are very coloured ranging from orange to red on their back, yellow to orange on their underside. Eft also have more rounded tail compared to adults. Red-spotted newt skin secrete toxins skin to defend themselves from predators. Efts are particularly toxic compared d to adult red spotted newts and their bright colouration warn other animals about the danger they are facing. Both adults Red-spotted newts and efts are normally active during the winter but in northern areas of distribution of the specie, individuals may hibernate burying themselves under rocks, in burrows or other protected spot, but they also hibernate directly in water. Red-spotted newt can live up 12 to 15 years in the wild and it’s a common aquarium pet. Remenber that you are not allowed to capture them and that amphibians population a in decline, so protect nature and leave them alone..